Dr. Vincent Anthony is board certified in Internal Medicine and Nephrology and has committed himself to building a streamlined operations process in order to provide high quality and efficient patient care. While he has deep expertise in other areas of medicine (such as Hypertension and Diabetes), Dr. Anthony is passionate about bringing a greater awareness to individuals on how critically important kidney function is to our overall health. 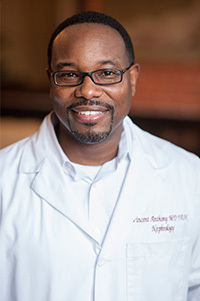 Raised in Jackson, MS, Dr. Anthony completed his undergraduate work and Master’s Degree in Public Health at Tulane University in New Orleans, LA. Dr. Anthony earned his MD from Thomas Jefferson Medical College in Philadelphia, PA. Following graduation, Dr. Anthony completed his Internal Medicine residency at Thomas Jefferson and completed his subspecialty training in Nephrology and Hypertension at Nassau University Medical Center in East Meadow, New York. He is currently working on his MBA and has an expected graduation date of 2015. In addition to his work domestically, Dr. Anthony has traveled to Asia as a part of the delegation of the American College of Physicians Executive’s to help open dialogue to improve health care systems. He has also traveled to Turkey as a delegate of the United States Peritonal Dialysis Association to share information on End-Stage Renal Disease Care. Besides his travels, Dr. Anthony has lectured to numerous committee groups on heath, wellness, and healing. He is the author of several articles on health and wellness and has authored several books and a textbook chapter. Dr. Anthony is married and has a daughter.